By buying this product you can collect up to 248 loyalty points. Your cart will total 248 loyalty points that can be converted into a voucher of 12,40 €. 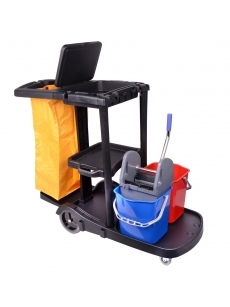 Trolley with 2 color buckets and wash (or garbage) bag holder, 3 shelves items. The housing is made of high quality plastic, designed for professional use in hotels, guest houses, hospitals, spa, nursing homes and the like. For an easy non-rotating rubber wheels convenient for everyday use. The body is built brooms and mark "Carefully slide lock. Supplied 2vnt.x17L bucket floor cleaning, floor cloths nugrežėjas, brooms lock with side supports 70L capacity reusable bag garbage or laundry.